Generic Company Place Holder geoSpark - WARNING: Highly Addictive! If you’ve yearned for the opportunity to control the forces of gravity, then your dreams may come true with this slick little game. Critical Thought Games in collaboration with Imangi Stuudios bring this minimalist title to your fingertips. GeoSpark provides some quick action within a retro-flashy package, but unfortunately the fun fades a bit too quickly. Freaky physics and electric visuals separate this title. GeoSpark is advertised in the App Store with a bold disclosure in its title: “WARNING: Highly Addictive!” The simple game combines the ‘make a path with your finger’ concept found in Flight Control with the ‘match three’ idea from Dr. Mario. Yet, contrary to the disclaimer, GeoSpark did not keep me glued to my iPhone the way Flight Control did, nor did it cause job-threatening all-nighters the way Dr Mario has. The player must clear so-called ‘sparks’ floating across the screen with a touch and then string similar sparks together for a higher score. Should two dissimilar sparks come in contact, then the game ends in a spectacular splash of pixels. But despite this familiar 'match three' formula, GeoSpark offers a unique game mechanic: the more items strung together, the greater the gravitational pull, causing surrounding sparks to get sucked towards your finger with increasing force, creating quite the frantic environment. The minimalist presentation of geoSpark is top-notch. The touch controls react perfectly even when the game gets frantic. The retro graphics look terrific and vastly improve upon those found in Critical Thought Games’ aesthetically similar GeoDefence. Meanwhile, the visuals—particularly the colorful explosions which fill the screen when the player fails—really pop out of the screen. You'll also have the excellent spacey music stuck in your head long after you put the game down. Sadly, in the end the very simplicity of this game ensures it becomes stale after a short period of time. Aside from global leaderboards, there is not much that keeps me playing. 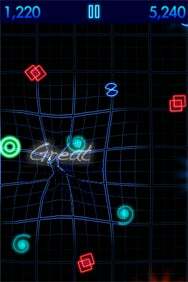 GeoSpark is a flashy single-concept title which is easier to put down then games such as Flight Control. Still, for $2, geoSpark is a decent time killer.